Three years ago I discovered Intelligent Assistant, which started off as DV Companion for Final Cut Pro, it has been on my Mac ever since. 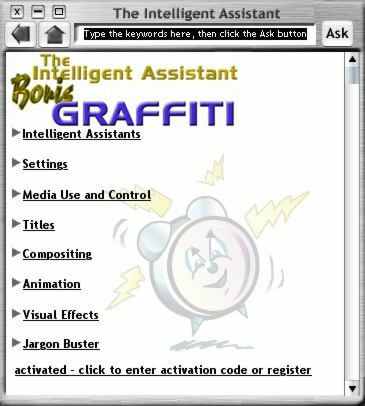 Over the past few years Intelligent Assistant has added other software products to its line: After Effects, Boris FX, Boris Graffiti, Boris RED, Cleaner, DVD Studio Pro, Final Cut Pro and Media 100. This Summer Intelligent Assistant moved its products to OS X. 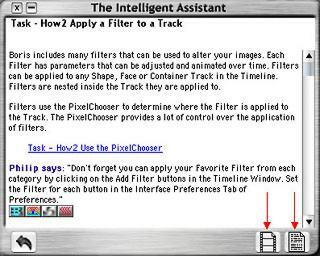 For those of you not familiar with Intelligent Assistant it is not a book, tape or CD/DVD. It is like a digital encyclopedia, all content is indexed, linked and searchable. It is unique in that it is installed onto your computer where it is ready to be called up at a moments notice. 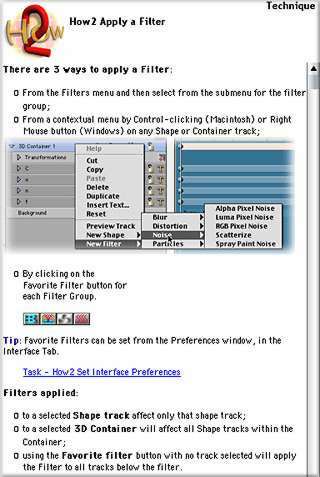 For Power Book users on the road this is invaluable. IA can be left open, floating above your application while you work. So what is Intelligent Assistant? Let's take a look. Launching IA opens its user interface on your monitor. Clicking on one of the categories will open a menu that is further divided by sections. Strategies - give an overview of the subject matter. Techniques - describes a work flow to produce the desired outcome. 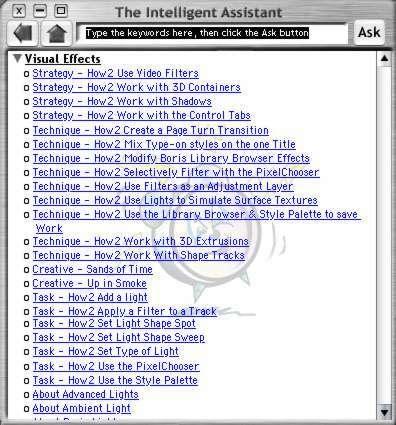 Creative - offers creative ideas and provides step by step instructions. Tasks - provides the actual step by step instructions. About - subject matter discussions. Shown below are Strategy and Technique windows. 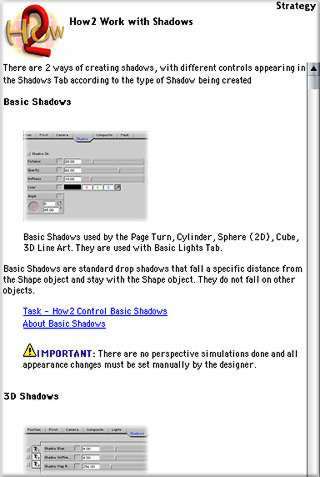 Textual instructions are accompanied by visuals. Throughout there are active links that when clicked move you further down the instructional path. Creative sections offer ideas that can be applied to your own work. It is in the Task window that you find the 'nuts and bolts' step by step instructions. This window is smaller than the other windows which is convenient as you will want this window open as you actually work in your application and follow the instructions. The Task window has two different views. As text, below left, with each step detailed. Or as a movie playing out the steps, below right. There are over 200 movies included. You can stop the movie and replay any part you want. The Voice Over explains what you are seeing on screen. You can switch back and forth between text and movies by clicking on the buttons in the bottom right of the Task window, red arrows below. I had not worked in Graffiti for some time so when I updated to Graffiti 2 it was like starting all over again. The manual that ships with Graffiti is typical of most manuals. It tells you what you can do but not how to do it. There are some tutorials on Graffiti at the Boris site, which did help, but my NLE is not on line. I think that the power of Intelligent Assistant is that while it does start by telling what you can do, it does not stop there. First it gives you Strategies, a game plan as it were. As you progress further, Techniques are discussed and options provided. At the base level are Tasks which take you step by step through the process. 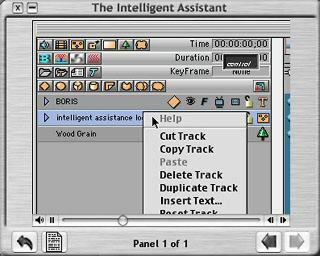 Tasks offer two versions, text and movies. I often play the movie several time to get the hang of it and then switch to text mode. With Graffiti up and running and the Task window open on my screen I can following the instructions while actually working in Graffiti. I mentioned that IA has moved to OS X and like many other products that have made the move, we will have to wait until the next version for some minor bugs to be fixed. The scroller only works by using the arrows or by clicking in the space above or below the "grab" bar in the scroller. You currently cannot drag across text in the Ask bar. It is necessary to back space through the existing text so that you can enter your next query. It appears that in Jaguar, 10.2, that the Ask bar now works properly. The Intelligent Assistant window will always return to center of screen when changing display modes rather than staying where you place the window on your screen. While these issues are a bit of an annoyance, IA works perfectly. 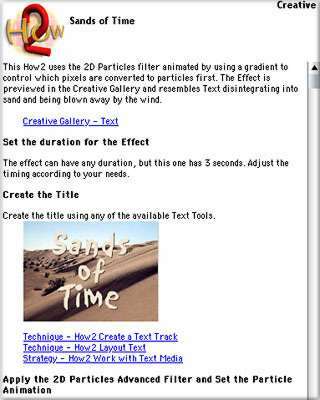 Graffiti 2 is a complex application with a steep learning curve. Having IA open on the screen as you work really facilitates learning this powerful application. 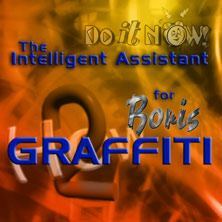 A 'Test Drive' of the Intelligent Assistant for Graffiti 2 is included with Graffiti 2 installer. The Test Drive is the complete Intelligent Assistant allowing you access to the full content for a limited number of page views. You can order the 'Test Drive' CD ROM from Intelligent Assistant for $5.